A tiny Scottish village is offering its annual invitation for music lovers to come along and enjoy the some of the best sounds on the folk circuit. The Moniaive Folk Festival, which celebrates its 18thanniversary from 10 to 12 May, is a much-loved feature in the country’s live music calendar. Festival director Stuart Macpherson said:“Our wee village is looking forward to welcoming everyone for the 18thMoniaive Folk Festival. “Over the years it’s grown into a really popular event, with fans coming from all over the country, and the world, to enjoy some of the finest folk sounds around. “But one of the best things is that it has never lost the friendliness and intimacy that makes it so special. Spotted Stripes Circus – Lord and Lady Flumperdinkle make a welcome return and mix with the crowd over the festival weekend. Festival Workshop and Parade – get involved with making props then take part in a colourful parade through the village. Little Fawn Theatre – enter the magic world of a travelling puppet theatre in a 1950s caravan. Clydebuilt Puppets – join this leading Scottish puppet theatre company for a workshop and a fun show. OBT consists of Tom Oakes (Ross Couper + Tom Oakes, Auvo Quartet) on guitars and wooden flute, Jon Bews (Malinky, James Yorkston, Cantrip) on five string fiddle and Daniel Thorpe (Young Traditional Musician of the Year 2010, Malinky, Tyde) on fiddle. Drawing on the music of Scotland combined with world music influences and new composition, OBT’s dynamic performances work as well in an intimate acoustic setting or on a packed festival dancefloor. Last year Kinnaris Quintet released Free One, their much anticipated debut album, to rave reviews. 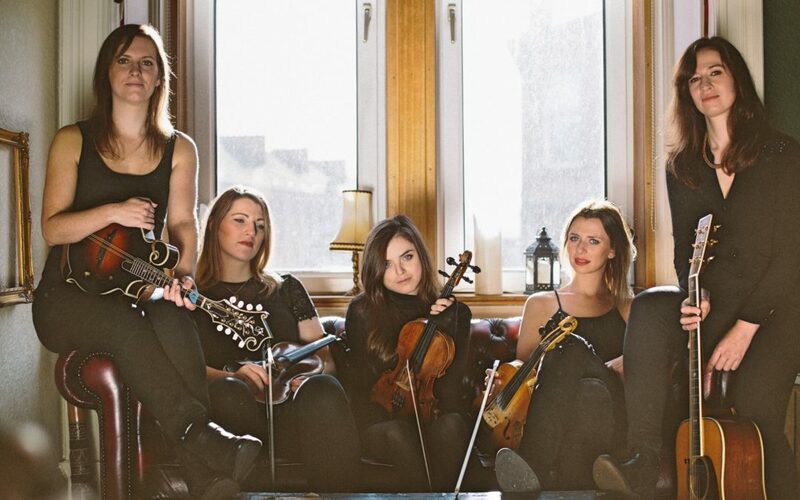 The Herald said it was “a great example of musicians moving the tradition forward…” All vigorous, driving, high spirited musicians in their own right Fiona MacAskill (fiddle), Laura Wilkie (fiddle), Aileen (Reid) Gobbi (5 string fiddle), Laura Beth Salter (mandolin) and Jenn Butterworth (guitar) have all come together to form the brand new quintet that is taking the Scottish traditional music scene by storm. See https://www.moniaivefolkfestival.com for full details. Prices: Friday evening or Saturday evening concerts from £15, both nights from £25. Camping from £15 one night or £25 for two. Weekend camping plus concerts £45 to £60. The Craigdarroch Arms is in Moniaive High Street.